About 3 months ago, Pluralsight released my Developing with Node.js on Microsoft Azure course. 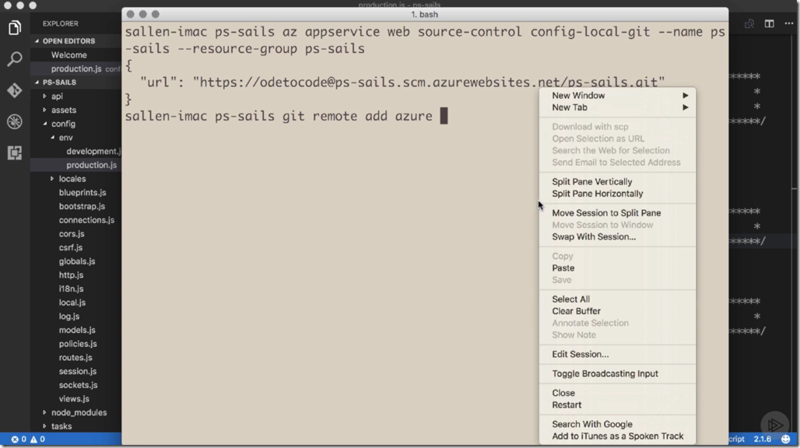 Recorded on macOS and taking the perspective of a Node developer, this course shows how to use Azure App Services to host a NodeJS application, as well as how to manage, monitor, debug, and scale the application. I also show how to use Cosmos DB, which is the NoSQL DB formerly known as Document DB, by taking advantage of the Mongo DB APIs. In the finale of the course I show you how to setup a continuous delivery pipeline using Visual Studio Team Services to build, package, and deploy a Node app into Azure. Hello guys, We are going to use a nano server for our node applications but we are having a lot of troubles, managing the services (create, start, restart, stop, delete, etc...), we were using Azure App Services, but for many reasons we decided to use a nano server but this transition has been painful... do you have a guidance or something like that for Node js vs Nano Servers? Or some of you can help me about a tool or something for application managing. Thanks in advance. For hosting a web app or api, I think App Services would be a better choice. If you have to use nano server instead, and you want high availability, you might consider using MS service fabric to manage the services.